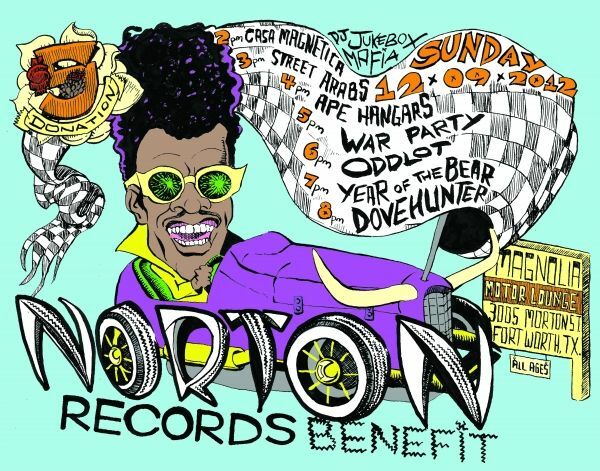 Please show your support for Brooklyn-label Norton Records, whose warehouse was hit by Sandy, by going to the Norton Benefit at Fort Worth’s Magnolia Motor Lounge on December 9th. For just $5, you get to see some amazing bands (Dove Hunter, Year of the Bear, Oddlot, War Party,The Ape Hangars, Street Arabs, Casa Magnetica, and DJ Jukebox Mafia Blake), and help out Norton! Here’s the Facebook event, and check out the official press release below. When Bill Miller first met Miriam Linna back in the late 70s, she played drums for The Cramps. After a transaction at a record convention he decided, “You can’t let a gal with taste like that slip away!” One year later, in 1978 the two of them started Kicks, a magazine devoted to obscure rock, soul and rockabilly. Eventually, in 1986 an article about psychobilly pioneer Hasil Adkins led them to start a record label, thus bringing to the world otherwise lost or unknown recordings that transcend the limits of conventional classification. They have brought music to countless fans, whether putting out new material or bringing into the light obscure titles from past generations. One series that they were responsible for was the three-volume compilation Fort Worth Teen Scene, released in 2004, spotlighting the massive garage rock scene in Fort Worth during the mid-60s. Four years later, Fort Worth historian Mark Nobles produced a documentary about the bands from that era. Directed by Melissa Kirkendall, Teen A Go Go presents audiences with more of the living context. Musicians and music lovers are a community connected by the songs, songwriters and the stories behind all of it. Considering Funkytown’s long history of making loud music, we thought it made sense to throw a party and raise some money to help Norton Records through this tough recovery. A collective of helpful forces will bring together a sensational smattering of Rock and Roll talent from Dallas and Fort Worth at Magnolia Motor Lounge Sunday December 9th. This entry was posted on November 28, 2012 at 12:40 pm, filed under News.